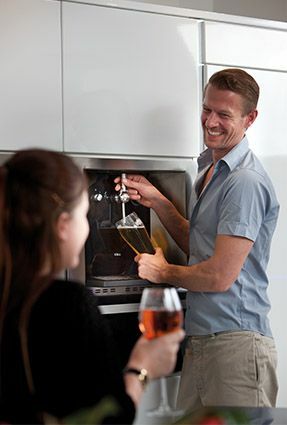 The ultimate in luxury kitchen design, draught beer on tap in your home. The BVB4 comes with LED lighting, drip tray and is easy to clean and maintain. 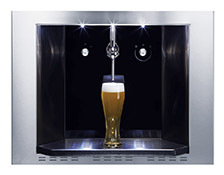 It dispenses chilled beer within 5 minutes and is thermostat controlled. With a sleek design and meticulous attention to detail, the integrated draught beer dispenser offers itself as a unique and professional appliance for your kitchen. Your home has to work for you. Who says you have to use that built-in space for a microwave? If you love draught beer then why not build your own dispenser into the kitchen design? All you need is a space available at the perfect height for pouring and a cupboard underneath to store the connected keg to bring the party spirit into your home. Save the space in your fridge that is usually taken up by beer bottles or cans and cut down on waste from all that excess packaging with a reusable beer machine. The kegs can be returned to the brewery and reused, while the connectors and lines can be cleaned between uses meaning that you are left with a recycling friendly, waste free alternative to crates of beer. This might not be top of the list of priorities but it is certainly something to consider if your recycling is made up of a proportion of this type of waste packaging. There is less cooling time too with a 5 minute chiller on the BVB4SS beer dispenser. No more waiting for cans and bottles to cool down in the fridge, which could take hours, or filling containers with ice and water to submerge drinks into for a party; which also often leaves a mess everywhere too. Your beer dispenser will cool the keg quickly and efficiently, leaving you to serve guests in their favourite glass or even host a ‘perfect pint’ pouring competition. Combine a built-in beer dispenser with one of our energy efficient and high performance wine coolers for the ultimate in entertaining storage. If you often have dinner parties or friends over, what could be more useful than perfectly stored, presented and served wine or beer just when you are ready to serve it? Beautifully designed, the steel and chrome exterior will coincide with any kitchen design allowing you to build this impressive functionality into your kitchen, whatever the style. There is also some stylish LED lighting that illuminates the area around the professional tap. It is low maintenance and practical too with a flash chiller and thermostat for performance and a removable drip tray for easy cleaning. There is no comparison to a perfect draught beer served in a chilled glass. Why compromise just because you are at home? Invest in some pint glasses that you really love and pre-chill them to create that holiday feeling of crisp beer in an ice cold glass. You could even get friends their own personalised glass for when they come over, just like regulars in a pub. Installing this into your home is a sure-fire way to impress friends and become renowned as the ‘perfect party host’. It will add an effortless extra to your evenings, sports viewing get together, BBQs as well as allowing you to entertain as if you are in the pub, but in the comfort of your own home. We’ve built our compact models with the enthusiast in mind, whether that is healthy cooking, entertaining, baking or being space-savvy there is an appliance for every fanatic, whatever their style.